Knowledge : Chuhaba-Obi - KIDORAKU Japan - What a Kimonoful World! Chuhaba-Obi is a formal Obi. It's worn by brides or girls with a bridal costume or girl's formal Kimono. It's 18-21cm in width, and 340-360cm in length. Chuhaba-Obi that is worn by brides with a bridal costume is called "Kakeshita-Obi". Generally, when women wear Furisode, they tie Fukuro-Obi. But only when brides wear "Uchikake", they wear Kakeshita Obi on Oh-Furisode. Uchikake is a garment with a long trailing skirt. 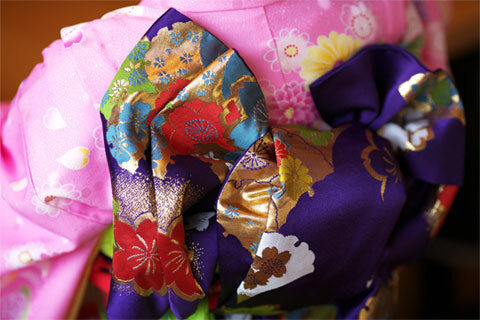 Chuhaba-Obi that is worn by girls with girl's formal Kimono is called "Iwai-Obi". About kid's formal kimono, we explain at another page later.